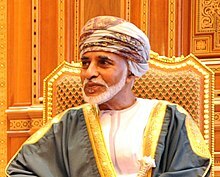 ↑ "Can Oman's Stability Outlive Sultan Qaboos?". Middle East Institute. अभिगमन तिथि 1 March 2017. ↑ Tribute to His Majesty Archived 18 जनवरी 2006 at the वेबैक मशीन. ↑ Allen, Calvin H.; Rigsbee, W. Lynn (2000-01-01). Oman Under Qaboos: From Coup to Constitution, 1970–1996 (अंग्रेज़ी में). Psychology Press. पपृ॰ 28–29, 34. आई॰ऍस॰बी॰ऍन॰ 9780714650012. ↑ PROFILE-Oman's Sultan Qaboos bin Said Archived 6 अक्टूबर 2011 at the वेबैक मशीन.. Forexyard.com (2011-03-25). Retrieved on 14 July 2011.